GIGABYTE TECHNOLOGY Co. Ltd., a leading manufacturer of motherboards and graphics cards, today announced its new FM2+ motherboards including the newest addition to its G1-Killer range of gaming motherboards, the GIGABYTE G1.Sniper A88X. Debuting two exclusive audio features including GIGABYTE USB DAC-UP, an exclusive feature optimized for users employing a Digital-to-Analog Converter, and Gain Boost which provides high gain output for advanced headphones and speakers, the GIGABYTE G1.Sniper A88X provides the highest caliber onboard audio experience for discerning audiophiles. GIGABYTE AMP-UP Audio combines a range of unique features and technologies that are designed to give audio enthusiasts and PC gamers more control over their motherboard audio than ever before. Featuring a gold plated USB 2.0 port, GIGABYTE USB DAC-UP provides clean, noise-free power delivery to your Digital-to-Analog Converter. DACs can be sensitive to fluctuations in power from the other USB ports, which is why GIGABYTE USB DAC-UP takes advantage of an isolated power source that minimizes potential fluctuations and ensures the best audio experience possible. GIGABYTE USB DAC-UP also allows the port to be configured in BIOS for enthusiast system configurations which do not require USB power to the DAC. This makes it suitable for high-end audio enthusiasts building extreme fidelity audio systems. To further optimize the audio experience provided by the onboard OP-Amp, GIGABYTE motherboards also debut Gain Boost. Gain Boost provides onboard switches to select between 2.5x and 6x amplification modes depending on output device. Most OP-Amps are capable of providing a high-gain audio output that is ideal for high-end headphones and speakers that have higher impedance headroom. Gain Boost allows users to switch between 6x and x2.5 amplification modes depending on the speakers or headphones being used. GIGABYTE motherboards are the world’s first to feature an onboard operational amplifier (OP-Amp). OP-Amps are commonly found in high-end audio equipment and offer not only amplification of the audio signal, but a superior audio experience generally. The motherboard’s OP-Amp is mounted on a socket which allows users to physically switch out and try different OP-Amps which offer distinct and nuanced properties that make the audio clearer, punchier and more life-like. Additional OP-Amps can be purchased separately to further expand audio capabilities. To help protect and insulate the the Realtek ALC898 audio processor and onboard amplifiers from electrostatic interference (ESD), the GIGABYTE G1.Sniper A88X motherboard features an audio noise guard that essentially separates the board’s sensitive analog audio components from potential ESD pollution at the PCB level. LED trace path lighting illuminates to show the separation of the PCB layers. The GIGABYTE G1.Sniper A88X motherboard uses the highest quality Nichicon MUSE ES series audio capacitors at each channel layout. These professional audio capacitors deliver the highest quality sound resolution and sound expansion to create the most realistic sound effects for professional gamers. 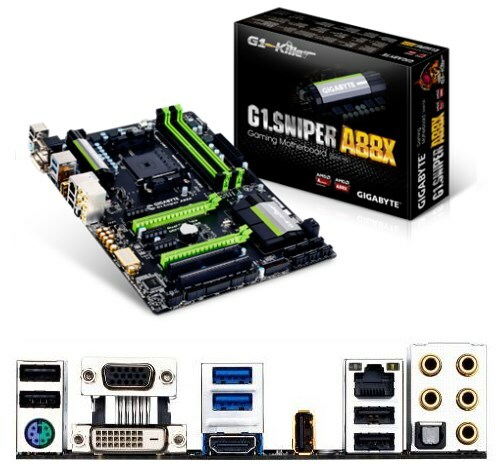 The GIGABYTE G1.Sniper A88X motherboard uses top quality gold plated hardware for improved connectivity and long lasting durability for the USB DAC-UP port and audio connectors. Gold has superb signal conductivity and will not tarnish over extended periods of use. The Realtek ALC898 audio processor is also shielded by a gold-plated cover which eliminates electrostatic interference. The GIGABYTE G1.Sniper A88X motherboard features the new FM2+ APU socket, and is designed to get the most from forthcoming ‘Kaveri’ AMD APUs, while preserving compatibility for current AMD FM2 ‘Trinity’ and ‘Richland’ APUs. FM2+ AMD APUs offer native support for 8 GT/s PCI Express gen 3.0 as well as DX11.1 support, integrating the high performance ‘Steamroller’ core. AMD socket FM2+ APUs also offer native support for 4K resolution displays on HDMI and DisplayPort.